In 2018, Huawei launched the first 40-megapixel camera smartphone in a very long time — the Huawei P20 Pro. We pitted it against one of the most beloved camera phones of all time, the 41MP Nokia Lumia 1020, to see which was better. Opinions were mixed, but the gist of our testing showed Huawei’s camera sensor was better but the company leaned far too heavily on oversharpening post-processing, which ruined a number of pictures. Huawei is back with another 40MP camera configuration in the Mate 20 Pro. While the hardware specifications look identical to the P20 Pro, Huawei’s hinted at sensor improvements that apparently allowed it to ditch the monochrome camera from the triple sensor array. Apparently, lenses have been improved, and post-processing seems to have been dialed back a bit. So what better excuse do we need to break out the Nokia Lumia 1020 again to see if things have changed. As far as we’re aware, the main camera sensor inside the Huawei Mate 20 Pro is essentially the same as the P20 Pro. It’s a 40MP, 1/1.7-inch sensor with 1.0µm pixel sizes that can be combined via pixel binning to produce 2µm 10MP shots for better light capture. The lens retains a f/1.8 aperture and 27mm focal length. On paper, the Nokia Lumia 1020 has an advantage, with a slightly larger 1.12µm pixel size from its 1/1.5 inch sensor. However, the Mate 20 Pro’s wider aperture should make up for this difference in light capture, and its more mature manufacturing process over the years should reduce pixel leakage and noise. It looks like a close call. However, paper specs don’t tell the whole story, and we would hope that image sensors have improved quite a lot over the past five years. A 40-megapixel camera is overkill for most shooting situations, but it’s really good for capturing extra detail in long distance and macro shots. That’s what we’re predominantly going to test here, looking for fine details, as well as general color balance and exposure. First, a full-frame outdoor shot. The most obvious difference here is the color balance. The Lumia 1020 opts for a warmer, more colorful pallet than the Mate 20 Pro. However, the Mate 20 Pro gets the nod here for its more realistic look. The Lumia 1020 oversaturates the grass. Closer inspection of the 100 percent crop reveals very similar levels of detail between the two cameras. The Mate 20 Pro has its pros and cons here. While there’s a smidgen of extra detail and highlight capture on the roof tiles, the sharpening and denoising algorithms ruin other aspects of the image. This is particularly noticeable in the shadows. While the Lumia 1020 presents smooth shadows on the side of the house, the Mate 20 Pro creates a spackled, painted-looking effect that’s not very realistic. The tree is also captured much more clear on the Mate 20 Pro, while the Lumia presents a very soft image that almost blurs the branches into the sky. Although Huawei’s extra clarity comes partly from the use of some sharpening in its post-processing pipeline. Unfortunately, the Lumia 1020 becomes increasingly noisy and smudged looking towards the edges of the image. It’s not unusual for camera resolution to be superior in the center of a camera frame, but the 1020 suffers from this problem quite noticeably. The Mate 20 Pro holds up a little better at the edges (see the grass and leaves in the image below), but we can again clearly see the heavy denoise algorithm working on the branches and shadows. Time for another outdoor example, but we’ll save some space and just look at the crop this time. Key things to look for in this picture is the clarity of the metal bars on the left, the noise and clarity of the text on the right, and the depth of the blacks in the shadows underneath the sculpture. Here the Lumia 1020 appears sharper in the foreground, particularly on the top left of the crop and around the edges of the sculpture. However, the background on the right of the crop is noticeably noisier and less defined than the Mate 20 Pro’s photo. It’s clear Huawei’s heavier reliance on denoise post-processing works better in some areas than others, and it doesn’t look very good on straight lines. Overall the colors are both pretty good. One final outdoor crop. Again, the Mate 20 Pro’s details pop more than the Lumia’s, but this is again a mix of post-processing and some small improvement to its resolvable resolution. The straight lines on the brickwork appear to suffer from Huawei’s denoise algorithm once again, but the sharpening does pick out some extra dynamic range in the texture detail. The Lumia is noisier than Huawei once again, which can be easily observed in the sky. There are definitely pros and cons to each camera here. One final note. The branches on the left in the Lumia 1020 picture seem slightly purple, a telltale sign of chromatic aberration from the camera lens. The effect pops up with the Mate 20 Pro, but to a lesser extent. The Mate 20 Pro isn’t immune from problems in this picture though — there’s a clear border on the top edge of the building. This doesn’t appear on the branches, where the Mate 20 Pro produced a noticeable halo, and it’s clear the sharpening effect isn’t as strong as before. This could be the result of the sharpening and denoise algorithm, or perhaps from multi-frame exposure stitching. Now for detail at close range. A couple of comparison shots are worth looking at here. The full frame examples showcase a very notable difference in exposure and colors between the two cameras. The Huawei Mate 20 Pro produces brighter shots, with better exposure but also sharper and more striking highlights. The Lumia 1020 is again darker and struggles slightly with the bright background of the overcast sky. However it is the more colorful of the two, and certainly does a good job of capturing the flower. Closer inspection of our chili plant shot again shows similar differences from the longer distance shots. The Lumia 1020 is notably softer than Huawei’s camera, producing slightly more noise and making some details slightly harder to discern. Detail capture is still very good, but the textures and small fibers on the leaves appear more pronounced in the Mate 20 Pro shot. However, there’s an odd haloing effect around the edge of the leaves in the Mate 20 Pro picture. It’s tough to tell if this the result of a typical oversharpening problem or a side effect of multi-frame exposure processing. The highlights are arguably also slightly overexposed in this image, which some purists certainly won’t care for. The painting effect of the denoise algorithm can also be noticed on some of the leaf textures. In this final shot, again the Huawei Mate 20 Pro comes out clearer, albeit with some rather strong highlights. Although most of the details are again like for like. The Nokia Lumia 1020 seems to have a little trouble keeping everything in focus, seemingly because of trouble with light capture, which is indicated by the rather large amount of noise near the bottom of the crop. Performance in low light is simple enough to judge. Less noise is obviously desirable, as long as an excessive denoise algorithm doesn’t brush over details. The P20 Pro was rather overzealous in that regard last time we tested, but the Mate 20 Pro has clearly dialed back the level of denoise processing applied. This example is a clear win for the Huawei Mate 20 Pro. Not only is the noise far less pronounced, but the color balance and exposure are notably better too. There is still some noise present, but that’s normal for such small pixel sizes in very low light. The Lumia 1020 struggled to focus with light any lower than this and clearly suffers from a substantial amount of grain. We can also see colors leaking across pixels, resulting in poorly defined edges around our little Android figure. Say what you will about about mobile camera technology development over the past five years, low light performance has improved substantially. If you’re not a fan of this subjective testing I’ve also put both phones through our camera testing suite, where we can accurately measure color accuracy, resolvable resolution, noise, and more. Here are the results. The results confirm the slight differences in detail capture, with the Huawei Mate 20 Pro edging out the Nokia Lumia 1020 in the key line width per picture height (LW/PH) measurement. The biggest differences between the two are found at the edge of the frame, where the Nokia Lumia 1020 detail capture falls off significantly — down as low as 381 LW/PH compared to 2875 in the center of the frame. The Mate 20 Pro also scores slightly better for noise, clocking in at just 0.79 percent versus 1.05 percent for the Nokia. Although as we’ve seen, this situation deteriorates in low light situations. 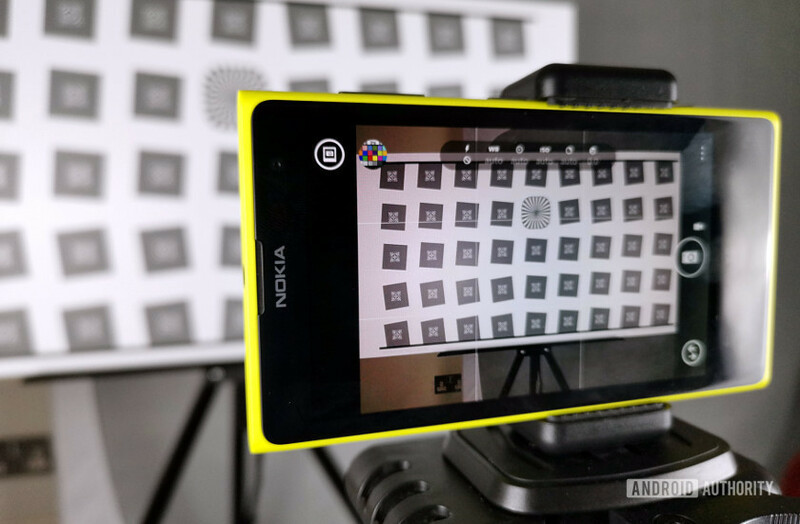 Our lab testing also confirms the color oversaturation we observed with the Lumia 1020. The handset scores an oversaturation of 121 percent, compared to a very accurate 104 percent for the Mate 20 Pro. The mean color error delta is also slightly worse at 3.84 versus 2.95. In other worse, the Mate 20 Pro is more accurate with its colors too. Based on the numbers from our lab, the Huawei Mate 20 Pro is the better shooter in detail capture, noise, and color accuracy. The Nokia Lumia 1020 still performs reasonably well by today’s standards, but the image quality towards the edges of the frame prevents the camera from fully realizing the benefits of its high-resolution sensor. At the very least, we can conclude Huawei’s work on the lenses and color processing in the Mate 20 Pro pay off. In real-world shots, we see the scientific analysis clearly reflected in the level of detail and colors from our sample shots. That being said, some lingering issues with Huawei’s sharpening and denoise algorithms prevent this from being a home run. The situation has improved from the P20 Pro, but there’s clearly still room to further tweak Huawei’s camera setup. Even so, it’s the best 40MP smartphone shooter in town.